Eunice and Peter Huf are artists who met in Mexico in the 1960s and lived in Ajijic on Lake Chapala for several years, before relocating to Europe with their two sons in the early 1970s. Eunice Eileen (Hunt) Huf, born 27 February 1933 in Alberta, Canada, can trace her family’s roots back to Switzerland and Germany. Her mother migrated to Canada from Bessarabia in Eastern Europe. Her father was born in Alberta. Eunice studied painting for two years in Edmonton, specializing in portraiture. She married young and worked for a couple of years before continuing her art studies at the Vancouver Art School (now the Emily Carr University of Art and Design) where she also honed her skills in photography. She then worked as a freelance artist in Canada and Arizona before deciding to visit Mexico to regroup following the break-down of her first marriage which ended in divorce. 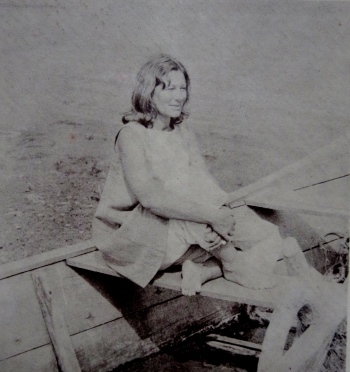 Eunice Huf at Lake Chapala, ca 1968. Photo by Peter Huf. Reproduced by kind permission. Her visit to Mexico was life-changing. After relaxing and painting for a few weeks in the small tropical town of San Blas on the Pacific Coast, Eunice went to a Sunday night Lion’s Club dance where she met a tall, handsome, German artist, Peter Paul Huf. It was January 1965 and the start of a life-long romance. Forty years later, the Huf’s elder son, Paul “Pablo” Huf, retold the story of this romance in an enthralling art display in Mexico City. After meeting at the dance, Eunice and Peter spent the next six months together, first in San Blas and then in Oaxaca and Zihuatanejo (Guerrero). It was in San Blas where they first met Jack Rutherford and his family with their vintage school bus, the start of a long friendship. Rutherford had dug the sand away from the walls of an abandoned building in order to display and sell his paintings. In February 1965, Eunice and Peter Huf exhibited together in a group art show on the walls of the then-ruined, roofless, customs house (partially restored since as a cultural center). After visiting Zihuatanejo, Eunice returned to Vancouver in June 1965, while Peter returned to Europe. They eventually reunited in Amsterdam later that year and traveled to Spain and Morocco from where Eunice continued on to South Africa for a short visit. By January 1967 they were back together (this time for good!) and aboard a ship bound for Mexico. After landing in Veracruz, they returned first to San Blas (where they displayed paintings in an Easter exhibition in the former customs house) and then to Ajijic, which the Rutherfords had suggested was a good place to live, paint and sell year-round. Peter and Eunice Huf married soon after arriving in Ajijic and lived in the village from May 1967 until June 1972. They have two sons: Paul “Pablo” Huf, born in 1967, and Kristof Huf, born in 1971. Eunice Hunt: Scarecrow Bride. 1970. Reproduced by kind permission of the artist. For almost all her time in Mexico (even after her marriage to Paul Huf), Eunice exhibited as Eunice Hunt, only changing her artistic name to Eunice Huf at about the time the couple left Mexico in 1972 to move first to Andalucia, Spain (1972-1974) and then to Bavaria, Germany. Both Peter and Eunice Huf regularly exhibited their work in Guadalajara, Tlaquepaque and Ajijic. They also sold artworks from their own studios in Ajijic, located first in a building on Calle Galeana and then at their home on Calle Constitución #30 near the Posada Ajijic hotel. (This building, incidentally, was later occupied by artists Adolfo Riestra and Alan Bowers). Eunice Huf supplemented the family income by giving private art classes to many people, including former Hollywood producer Sherman Harris, the then manager of the Posada Ajijic. Eunice kept an iguana, that she had borrowed to paint, under her bed, and had a little iguana, too. 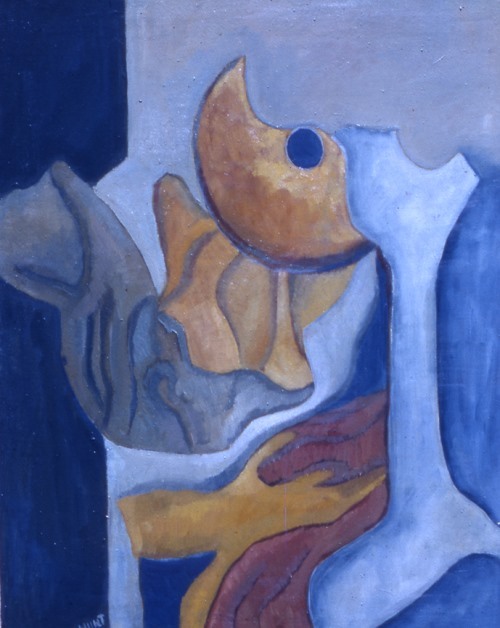 Peter and Eunice were founder members of a small collective of artists, known as Grupo 68, that exhibited regularly at the Camino Real hotel in Guadalajara and elsewhere from 1967 to 1971. Grupo 68 initially had 5 members: Peter Huf, Eunice Huf, Jack Rutherford, John K. Peterson and (Don) Shaw (who was known only by his surname). Tom Brudenell was also listed as part of the group for some shows. Jack Rutherford dropped out of the group after a few months, but the remaining four stayed together until 1971. The exhibitions at the Camino Real hotel began at the invitation of Ray Alvorado, a singer who was the public relations manager of the hotel. Members of Grupo 68 began to exhibit regularly, every Sunday afternoon, in the hotel grounds. Later, they also exhibited inside the hotel at its Thursday evening fiesta. 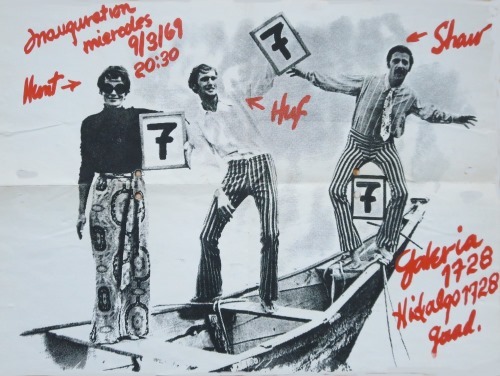 The Hufs’ first joint show in Ajijic was at Laura Bateman’s gallery, Rincón del Arte, which opened on 15 December 1967, when their firstborn son was barely two months old. 1968 was an especially busy year for the Hufs. They were involved in numerous exhibitions, beginning with one at El Palomar in Tlaquepaque which opened on 20 January. Other artists at this show included Hector Navarro, Gustavo Aranguren, Coffeen Suhl, John Peterson, Shaw, Rodolfo Lozano, and Gail Michael. The Ajijic artists in this group, together with Gail Michael, Jules and Abby Rubenstein, and Jack and Doris Rutherford, began to exhibit at El Palomar every Friday. In May 1968 the Galeria Ajijic (Marcos Castellanos #15) opened a collective fine crafts show. Eunice and Peter Huf presented “miniature toy-like landscapes complete with tiny figures and accompanying easels” which were popular with tourists, alongside wall-hangings, jewelry and sculptures by Ben Crabbe, Beverly Hunt, Gail Michael, Mary and Hudson Rose, Joe Rowe and Joe Vines. The next month (June 1968), the Hufs were back in Guadalajara, exhibiting in the First Annual Graphic Arts Show (prints, drawings, wood cuts) at Galeria 8 de Julio in Guadalajara. This show also featured works by John Frost, Paul Hachten , Allyn Hunt, John K. Peterson, Tully Petty, Gene Quesada and Don Shaw. Reviewing the show, Allyn Hunt admired Eunice Hunt’s “Moon Trap”, saying it “has a lyrical, fantasy-like quality”. Eunice Hunt: Still llife. 1969. Reproduced by kind permission of the artist. The “re-opening” of Laura Bateman’s Rincón del Arte gallery in Ajijic (at Calle Hidalgo #41) in September was accompanied by a group show of 8 painters-Tom Brudenell, Alejandro Colunga, Peter Paul Huf, Eunice Hunt, John K Peterson, Jack Rutherford, Donald Shaw and Coffeen Suhl – and a sculptor: Joe Wedgwood. 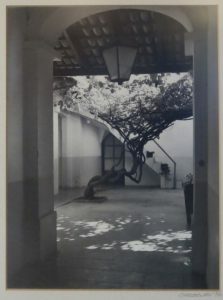 At the same time as Huf’s solo show, Grupo 68 (listed as Peter Paul Huf, Eunice Hunt, John K Peterson and Shaw) shared the Galería del Bosque (Calle de la Noche #2677) in Guadalajara with José María de Servín. This event was also part of the Olympics Cultural Program. Towards the end of 1968, the Hufs co-founded a co-operative gallery “La Galería” in Ajijic, located on Calle Zaragoza at its intersection with Juarez, one block west of El Tejaban. On Friday 13 December 1968, the month-long group show for the “re-opening” of La Galería in Ajijic was entitled “Life is Art”. It consisted of works by Tom Brudenell, Alejandro Colunga, John Frost, Paul Hachten, Peter Paul Huf, Eunice Hunt, John K Peterson, Jack Rutherford, José Ma. De Servin, Shaw, Cynthia Siddons (now Cynthia Luria), and Joe Wedgwood. Art lovers attending gallery openings at this time were often served a tequila-enriched pomegranate ponche alongside snacks such as peanuts. Somehow, in this crowded year, the Hufs also managed to fit in an exhibition at Redwood City Gallery in California. In February 1969, Eunice and Peter Huf joined with (Don) Shaw to exhibit at the 10th floor penthouse Tekare Restaurant at Calle 16 de Sept. #157, in Guadalajara. This location has fame as the first place where jazz was played in Guadalajara. Later that year, Eunice Huf had a showing at the co-operative La Galería in Ajijic. “Grupo 68” (Eunice and Peter Huf, Don Shaw and John K Peterson) held a showing of works at The Instituto Aragon (Hidalgo #1302) in Guadalajara in June 1969. Three of these artists (the Hufs and Shaw) held another show shortly afterwards in Guadalajara at Galeria 1728 (Hidalgo #1728). That gallery was owned by Jose Maria de Servin and the show was entitled 7-7-7. It featured seven works by each artist with the promotional material featuring a pose by the three artists emulating the Olympic scoring system. The following year (1970), an Easter Art Show which opened at the restaurant-hotel Posada Ajijic on 28 March featured works by Eunice and Peter Huf, John Frost, John K. Peterson, Bruce Sherratt and Leslie (Maddox) Sherratt. 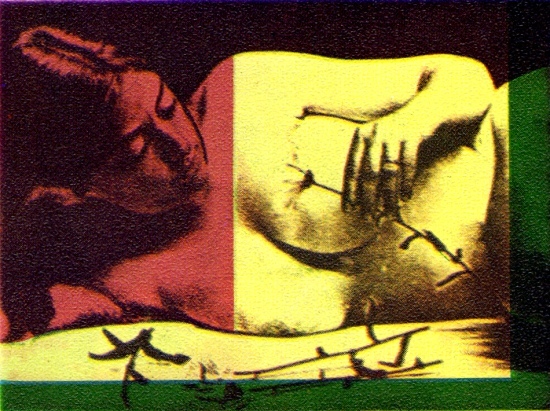 In June 1970, Eunice Huf’s work was included in a group showing at the Casa de la Cultura Jalisciense in Guadalajara. Other Lakeside artists with works in this show included Peter Huf, Daphne Aluta, Mario Aluta, John Frost, Lesley Maddox and Bruce Sherratt . In May 1971, both Peter Huf and Eunice Hunt were among those exhibiting at a Fiesta de Arte in Ajijic, held at a private home. More than 20 artists took part in that event, including Daphne Aluta; Mario Aluta; Beth Avary; Charles Blodgett; Antonio Cárdenas; Alan Davoll; Alice de Boton; Robert de Boton; Tom Faloon; John Frost; Dorothy Goldner; Burt Hawley; Lona Isoard; Michael Heinichen; John Maybra Kilpatrick; Gail Michael; Bert Miller; Robert Neathery; John K. Peterson; Stuart Phillips; Hudson Rose; Mary Rose; Jesús Santana; Walt Shou; Frances Showalter; Sloane; Eleanor Smart; Robert Snodgrass; and Agustín Velarde. Eunice Huf. Red with clouds. 1994. Reproduced by kind permission of the artist. Shortly before leaving Mexico, the Hufs illustrated a short 32-page booklet entitled Mexico My Home. Primitive Art and Modern Poetry With 50 easy to learn Spanish words and phrases. For all children from 8 to 80, published in Guadalajara by Boutique d’Artes Graficas in 1972. The poems in the booklet were written by Ira N. Nottonson, who was also living in Ajijic at the time. The illustrations in the book are Mexican naif in style, whereas their own art tended to be far more abstract or surrealist. Eunice and Peter Huf left Mexico in the summer of 1972 with every intention of returning, but never did, despite making plans in early 1976 for shipping their recent works from Germany to Ajijic for a show at Jan Dunlap’s Wes Penn Gallery. According to organizers, the artists wanted to return to Ajijic permanently. It appears that this show never actually took place, owing to complications of logistics and customs regulations. On moving to Europe, the Hufs lived near Nerja, in Andalucia, southern Spain, for a time, before settling in 1974 near Peter’s hometown of Kaufbeuren in the Allgäu region of southern Germany. The couple now have studios in the house where he was born in Kaufbeuren. Their work, known for the use of bright colors, has appeared regularly in exhibitions over the years, with both artists winning many awards along the way. Eunice Huf. Excerpt from “Taking time out”. Eunice Huf’s lengthy artistic career has continued unabated. The long list of exhibitions in which her work has featured includes: University Exhibit, Edmonton (1962); City Gallery Vancouver (1963); Downtown Gallery, Tucson, Arizona (1964); Stellenbush, South Africa (1966); Galeria Aduana, San Blas, Mexico (1966); Rincon del Arte, Ajijic (1967); Galeria 8 de Julio, Guadalajara (1968); Redwood City Gallery, California (1968); La Galeria, Ajijic (1969); Tekare, Guadalajara (1969); El Instituto Aragon, Guadalajara (1970); El Tejon [? Tejabán ? ], Ajijic (1971); El Rastro, Marbella, Spain (1972); followed by many other exhibitions in Spain and across Germany. Huf was represented by Munich-based Galeria Hartmann in International Art Fairs in Cologne and Basle. Both Eunice and Peter Huf were regulars until 2013 at Munich’s Schwabing Christmas Market, held annually since 1975. Unlike her husband’s works which are usually painted in acrylics, Eunice Huf prefers oils and line drawings. She has produced several somewhat whimsical, exquisite, little books featuring her deceptively simple line drawings, but also does larger works, including paintings described by one reviewer as shaped by the open expanses of her native Canadian prairies. I am very grateful to Eunice and Peter Huf for their warm hospitality during a visit to their home and studio in October 2014 which has led to a lasting friendship. Their archive of photos and press clippings from their time in Mexico proved invaluable, as did their encouragement and their memories of people and events of the time. Ira N. Nottonson. 1972. Mexico My Home. Primitive Art and Modern Poetry With 50 easy to learn Spanish words and phrases. For all children from 8 to 80. (Guadalajara, Mexico: Boutique d’Artes Graficas. 1972. 32pp, short poems illustrated with 16 paintings by Eunice and Peter Huf. Orville Charles Goldner (1906-1985) was an art director, puppeteer and special-effects artist who visited Ajijic with his wife Dorothy Goldner in the early 1970s. Goldner was born in Toledo, Ohio, on 18 May 1906 and died on 28 February 1985. He studied at the Toledo Museum School of Design in his native town before moving to Oakland, California, to study at the California College of Arts and Crafts in Berkeley (now California College of the Arts). Here, he met Dorothy (“Dot”) Thompson Goldner (1906-2005); the couple married in October 1925 and had two children. Soon after their marriage, the young couple moved to Hollywood. In the late-1920s, they were members of a traveling Shakespeare Theater Group and peripatetic marionette show (1926-1930). Goldner’s long and varied career in the movie business began in 1927 when he worked at Kinex Studio in Hollywood as a technical director, designer, and creator of animated films and special effects. In the early 1930s, Goldner worked for RKO Studios on such films as The Most Dangerous Game (1932) and King Kong (1933). 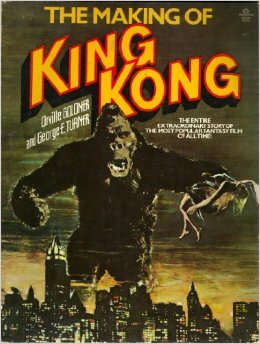 Orville Goldner later co-authored (with George E. Turner) The Making of King Kong: The Story Behind A Film Classic (1975). In the late 1930s, Goldner and his wife made many educational films for the state of California. One of his lasting legacies is an astonishingly powerful collection of photographs of migrant farm workers in California and their children. He spent the first few months of 1940 documenting families on behalf of the California Department of Education and later also photographed Hupa Indian students and their lifestyles on the Hoopa Valley Indian Reservation in Humboldt County. See Picturing California’s Migrant Children: Orville Goldner’s Photographic Trek of 1940 for more details. In 1935, Goldner had worked as an art director at the California-Pacific International Expo and he was given a similar role at the Golden Gate International Exposition of 1939-1940. A series of four short, silent, color movies taken at the Golden Gate International Exposition on Treasure Island in San Francisco (1939/40), by Orville Goldner, can be viewed online via this web page. The movies comprise the “Dorothy Goldner Collection“, now housed in the San Francisco Bay Area Television Archive. From our perspective, the most interesting by far is that relating to the “Art in Action” exhibition which includes footage showing Diego Rivera painting the Pan American Unity Mural at that event. It also portrays several other artists demonstrating their techniques in sculpture, mosaics, printing, doll making, weaving, pottery and axe carving. The Mexican pavilion at the Golden Gate International Exposition is shown in the film entitled “Pavilions, parades & soap box derby at Golden Gate Exposition“. Other artists associated with both Lake Chapala and the Golden Gate International Exposition include John Langley Howard (1902-1999), Louis Ernest Lenshaw (1892-1988), Robert Pearson McChesney (1913-2008), Ann Sonia Medalie (1896-1991), Max Pollak (1886-1970) and Charles Frederick Surendorf (1906-1979).. When the U.S. entered the second world war, Goldner joined the U.S. Navy, where he headed the U.S. Navy’s Training Films and Motion Picture branch from 1942 to 1946. His work in this position won him a Commendation Ribbon from the Secretary of the Navy, as well as the award of the Order of the British Empire from the U.K. government for his work with the British Armed Forces. After the second world war, the Goldners went to Europe and lived for several years in France before returning to San Francisco. For the remainder of his career, Goldner focused on the production of documentary films and visual material for educational purposes. He was Director of Production (1946-49) and later an overseas film producer (1949-52) for Curriculum Films in New York. Orville Goldner worked with his wife on numerous documentary film strips including A Colorslide Tour of Mexico Land of Sun and Laughter South of the Border (1961). This publication, with 32 color slides and a 33 1/3rpm record narrated by Cesar Romero, was edited by Darlene Geis and published by Columbia Record Club, New York in 1961. The Goldners also made Doña Rosa: Potter of Coyotepec, a 10-minute color film released in 1959, which shows Doña Rosa de Nieto, from San Bartolo Coyotepec in Oaxaca making a pot (olla) and firing her creations in an underground kiln. From 1967 to 1971, Goldner was a professor of Mass Communications and Director of the Audio-Visual Center at Chico State College. 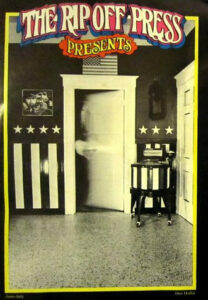 In 1968, Orville and Dorothy Goldner formed the film production company Visual Americana. Their best-known collaboration from this time was on the award-winning ethnographic film Three Stone Blades, for which Ira Latour was cinematographer and Valerie L. Smith was anthropology consultant. The film was awarded a bronze medal at the New York Film Festival. It recreates a folktale of the Inupiat (Eskimo) people of Point Hope, Alaska, the farthest northwest village in North America, about the fate of a widow and her children in the Arctic. The Port Hope area has now been abandoned because of flooding by melting ice. “Goldner, head of Visual Americana, is visiting friends here prior to putting the finishing touches on his latest film, a study of an Eskimo legend filmed in Alaska. After preparing the film for distribution, Goldner and his wife, Dorothy, will go to Chapala, Mexico, for an extended stay.” (Amarillo Globe-Times, 12 November 1970). Documents relating to Orville Goldner’s career can be found in two university archives. Parks Library at Iowa State University houses a collection of his papers from 1926-1982 while California State University, Chico, has materials relating to the period between 1935 and 1957 (mainly related to his photographic study of migrant farm workers in California and their children). 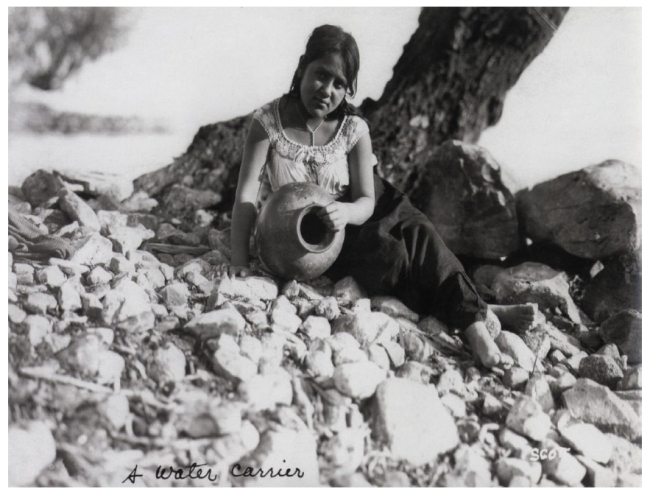 Dutch-born photographer Jacques Van Belle, who died in Honolulu, Hawaii in 2012 at the age of 88, took several black and white photographs of Ajijic which were used for postcards. 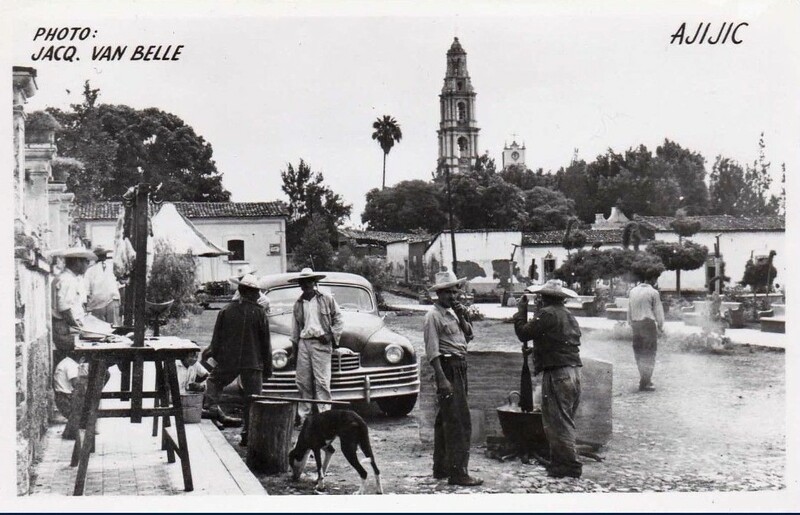 The postcard views, presumed to date from the mid-1950s, included at least two of the “Hotel Laguna” (Posada Ajijic) as well as one of the bee hives in Neill James’s residence, Quinta Tzintzuntzan (now part of the Lake Chapala Society complex), and one of Ajijic taken from the north side of the plaza. In addition to his photography, Van Belle was a real estate broker in Hawaii. Van Belle and his wife Helen Aro Van-Belle had a son, Jacques, Jr. and were definitely living there by July 1972. Copyright registrations for 1973 show that Van Belle produced, and copyrighted, a pen and ink drawing entitled “With aloha from Jacque Van Belle’s Little Eurasia” (Little Eurasia was the name of his company in Hawaii], together with a matching envelope, and the “Royal Hawaiian Birthday Calendar”. The calendar had color photos by Van Belle on its six pages (two months to a page), with each page dedicated to a different member of Hawaiian royalty. The calendar also signposted famous births, deaths, and other significant events for Hawaii. Copies of this calendar still occasionally appear for sale online as collectibles. Honolulu Star-Advertiser Obituaries: 30 March 2012. John Lee (1931-2013) and his second wife, novelist Barbara Moore, spent a freelance year in Ajijic in 1962-63 and then returned for three months almost every summer for the next decade. Lee was a prolific writer, photographer and educator who penned thousands of newspaper articles, several non-fiction books and a dozen novels, including two NY Times best-sellers, and a Book-of-the-Month Club choice. During the 1950s, his award-winning photographs were published in most of the major newspapers and magazines of the time. The portrait of Willard Marsh on the dust jacket of his novel Week with No Friday, set at Lake Chapala, was taken by Lee. Lee and his wife thoroughly enjoyed their visits to Lake Chapala. In retirement, using the name Bestjonbon, he compiled several YouTube videos about his trips to Mexico, the most interesting of which, for our purposes, is Ajijic Artists 50 years ago, a video which includes photographs related to the life and work of the following authors and/or artists: Gina Dessart Hildreth, Willard Marsh, James Kelly, Tink Strother, Carlos López-Ruíz, Ernesto Linares [Ernesto Butterlin], Eric ____, a former USAF pilot, John Lee, and Barbara Moore. Other short YouTube videos compiled by Lee include Ajijic 50 years ago; Small Town Bullfight I; Small Town Bullfight II; and Fiesta Ajijic – 45 Years Ago. Born in Oklahoma on 12 March 1931, Lee was raised and educated in Brownsville, Texas. After earning a B.A. at Texas Tech in 1952, he immediately began work as a journalist. While at Texas Tech, he married fellow student Jeane Womack; the couple had a daughter, but the marriage ended in 1956. The following year, Lee married a fellow reporter, Barbara Moore, who later became a novelist. The couple lived in Spain for a year, and then worked in Denver and Ohio before moving to Mexico in 1962 to focus on writing fiction. Lee earned a masters in Journalism at West Virginia University with a thesis about English-language newspapers around the world. Lee’s teaching career included stints at West Virginia University; the American University in Washington, D.C., where his students included Tom Shales, who later won a Pulitzer for TV criticism; the University of Arizona (1968-1972); New York University; California State University in Long Beach (where he undertook work towards a PhD); the University of Idaho; and at the University of Memphis (then known as Memphis State). He retired from teaching in 1997. Lee wrote or co-wrote several non-fiction books including two for journalism students: Feature Writing for Newspapers and Magazines (1988) and Modern Mass Media (1990). Both books enjoyed several editions, and the latter was translated into Spanish in 1993. Earlier works include The Diplomatic Persuaders: New Role of the Mass Media in International Relations (1968); and (with wife Barbara Moore Lee) Monsters Among Us: Journey to the Unexplained (1975) and Learning to Judge the Doberman Pinscher (1982). 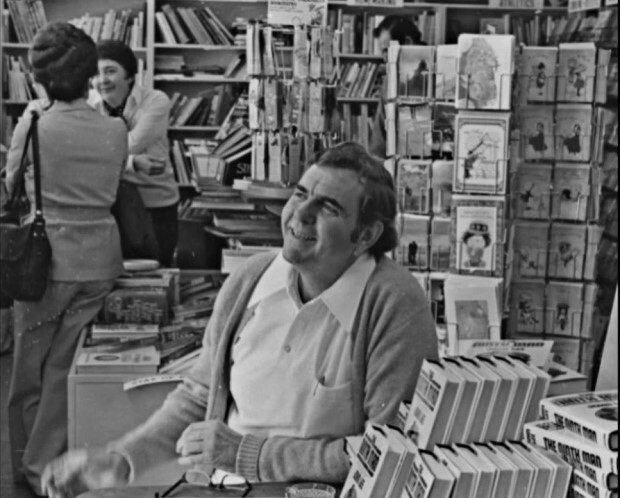 John Lee’s first novel was Caught in the Act (1968) set in Spain. He followed this with Assignation in Algeria (1971); The Ninth Man (1976); The Thirteenth Hour (1979); Lago (1980); Stalag Texas (1990); Olympia ’36 (2011); and Old Spies Never Die (2011). In The Ninth Man, his best-known book, a Nazi spy enters the White House and attempts to assassinate President Franklin D. Roosevelt. Lee also used the pen names of “James Lake” for stories in men’s magazines and “Joy Beverlin” for two romance novels: Whisper the Wind (Createspace 2011) and Bells of San Blas, which was never published. In later life, Lee also dabbled in art, and held several one-man shows in Texas. Following the death in 2002 of Barbara Moore, Lee married Shirley Miller in 2004. The couple lived on a ranch in Texas, painting, writing and raising racehorses, until Lee’s own death in 2013. I am very grateful for having had the opportunity to talk and correspond with John Lee several times in his final years. He was an enthusiastic supporter of this project to document the authors and artists associated with Lake Chapala. 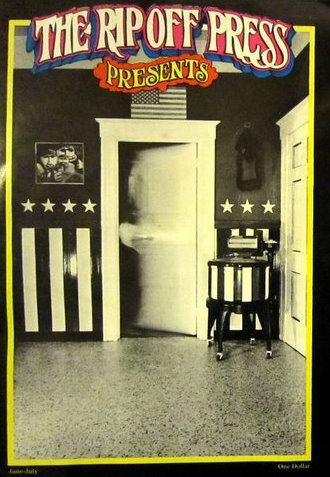 Photographer Michael Heinichen (born ca 1944) is best known for his portrait of Dave Sheridan, used on the cover of the first issue (June/July 1972)] of The Rip Off Review of Western Culture, published in the summer of 1972. The Rip Off Review of Western Culture was a short-lived underground comics magazine from San Francisco that featured the work of many noteworthy underground artists and writers. Heinichen lived in Mexico for some time – certainly more than he originally intended. His link to Ajijic is via Beverly Johnson who was already living there. In 1969, Johnson returned to California to renew her tourist papers, and met and fell in love with Heinichen. Early in 1970, they returned to Ajijic where Heinichen taught Johnson photography and darkroom techniques. Some of his work was included in the “Fiesta de Arte” in May 1971 at the home of Frances and Ned Windham at Calle 16 de Septiembre #33 in Ajijic. More than 20 artists took part in that event, including Daphne Aluta; Mario Aluta; Beth Avary; Charles Blodgett; Antonio Cárdenas; Alan Davoll; Alice de Boton; Robert de Boton; Tom Faloon; John Frost; Dorothy Goldner; Burt Hawley; Peter Huf; Eunice (Hunt) Huf; Lona Isoard; John Maybra Kilpatrick; Gail Michael; Bert Miller; Robert Neathery; John K. Peterson; Stuart Phillips; Hudson Rose; Mary Rose; Jesús Santana; Walt Shou; Frances Showalter; Sloane; Eleanor Smart; Robert Snodgrass; and Agustín Velarde. By summer 1972, Heinichen had amassed a significant body of work from his travels around Mexico and had also separated from Johnson and moved to Jocotepec to live with his new girlfriend, Laura Katzman. The following year, it seems that Heinichen and Katzman visited Columbia. On their return to Mexico City, they were arrested at Mexico City international airport and charged with possession of a kilo of cocaine between them. They were each sentenced to seven and a half years in jail. It is unclear exactly what became of Michael Heinichen and Laura Katzman, though a record exists of a divorce, in May 1984 in San Francisco, between a Michael Heinichen and his wife Laura. Leonet (“Leo”) Matiz Espinoza was a Colombian photographer and caricaturist who lived and worked in Mexico in the 1940s. 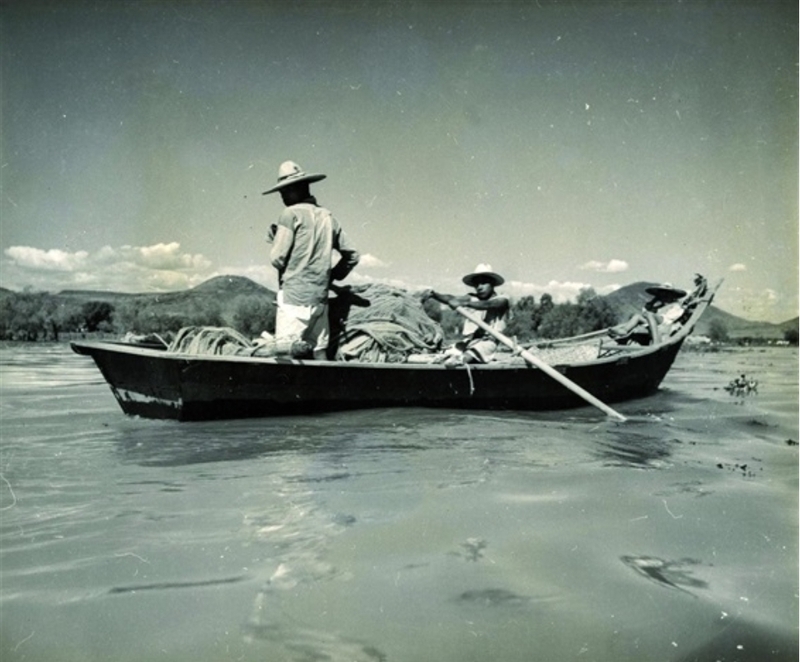 In 2011, eight gelatin silver prints in a series called “Fishing on Lake Chapala” came up at auction with an estimate of 8000 Euros; one of these eight images appears below. Matiz was born on 1 April 1917 in Aracataca, Colombia, coincidentally the birthplace of novelist Gabriel García Marquez. He left his native Colombia for Mexico City in 1939, hoping that his artistic talents would enable him to find success there. He traveled overland from Panama via Costa Rica, Nicaragua, El Salvador and Guatemala. Matiz, whose long black hair, and gangster-like mustache complemented his mischievous sense of humor and absurdly colored jackets, would eventually have seven marriages in all. Leo and Celia arrived in Mexico in 1941 as newly-weds and Leo quickly established himself as a caricaturist and photographer, claiming to have chosen the latter more for its economic rewards than because it was his first love as an artist. Matiz held several exhibitions of his work in Mexico City in the early 1940s. The first, entitled “Fotos y Dibujos” (“Photographs and drawings”), opened at the Museo de Bellas Artes (Opera House Museum) in Mexico City in 1941 with a speech by the Chilean poet-diplomat Pablo Neruda. In June of the following year, “El Pueblo de México” (“The People of Mexico”) in Mexico City’s Galería de Arte y Decoración showcased 59 photographs taken in Colombia, El Salvador and Mexico. The Mexican images included portraits, scenes of everyday life and artistic shots taken in Veracruz and elsewhere. 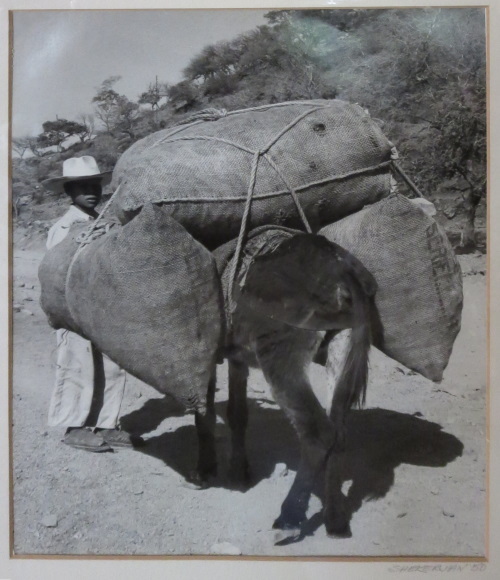 Photograph #6 in the catalog was “Cabezas, Chapala” (“Heads, Chapala”). In 1943, Matiz arranged another exhibit, entitled ““Tipos y Costumbres de México” (“Characters and Customs of Mexico), at own photo studio on Avenida Juárez in downtown Mexico City. Leo Matiz: Lake Chapala (ca 1942). Reproduced by courtesy of Leo Matiz Foundation. While the precise dates of his visit, or visits, to Lake Chapala are unknown, Matiz sent a special photo-report on the lake to the magazine Así. The report, entitled “Chapala, mar jaliciense” (“Chapala, Jalisco’s Sea), was based on several outstanding examples of Matiz’s photos, and was published in Así on Valentine’s Day in 1942 (Así # 66, 14 February 1942: 31-35). 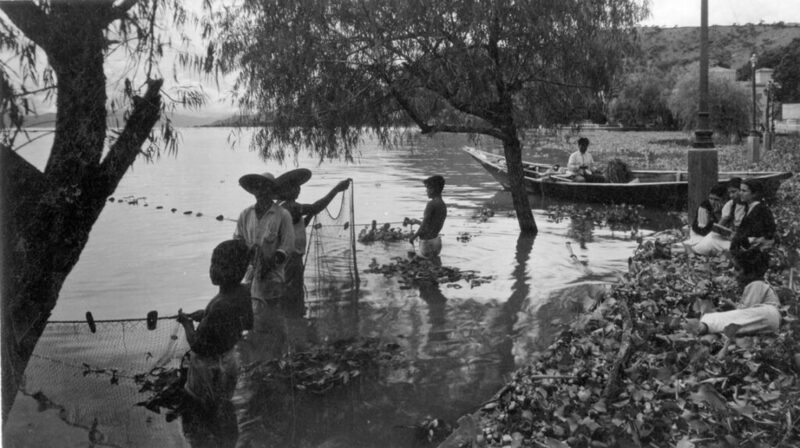 One photo in that article shows the main church and beach in Chapala as viewed from the lake, but most depict fishermen going about their work. 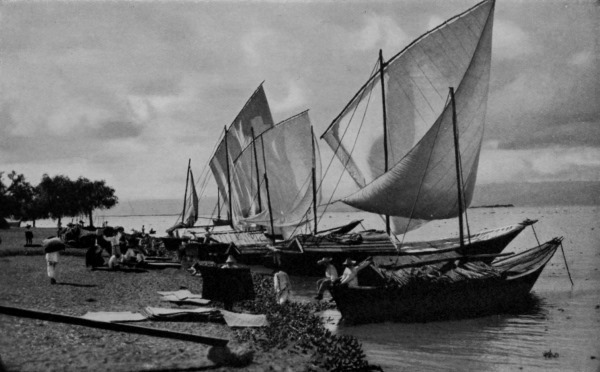 Several views of fishermen tending their nets are taken close to the lake shore and show masses of lirio (water hyacinth), though this is not commented on in the accompanying text which focuses, instead, on the superior eating quality of the lake’s fish, especially the highly prized whitefish. Matiz was not only a photographer. In Mexico, he also honed his skills as a caricaturist, influenced by the work of Guadalupe Posada and others, transferring these same skills of keen observation and astute choice of angles to his photography. As a result, his work regularly featured in the pages of magazines such as Así, Life, Reader’s Digest, Harpers Magazine, Look and Norte. He was also active in the world of cinematography. As Matiz’s fame grew, so did the invitations and commission he received. In 1944, he held a solo show of “Watercolors and Paintings” at the Advertising Club of New York in New York City, and, in 1947, his work was included in a group show at the Museum of Modern Art (MoMA) in New York. Solo shows of his work have since been held in numerous countries, from Switzerland, France, Italy, and Austria to Colombia, Venezuela, Bolivia and Australia. The indefatigable Matiz traveled widely across the country. In the mid-1940s he accompanied Gerardo Murillo (Dr. Atl) to watch the birth of Paricutín, the volcano that erupted in a farmer’s field in Michoacán. On another occasion, he visited the infamous Islas Maria penitentiary, off the coast of Nayarit, documenting the lives of its prisoners. Throughout the 1940s, Matiz was in great demand in Mexico City. He considered José Clemente Orozco to be his mentor and father figure. At one time or another, all the major celebrities of the day, from stars of stage and screen such as Mario Moreno (“Cantinflas”), Dolores del Río, Agustin Lara and María Félix (with whom he had an amorous relationship) to artists such as Orozco, Diego Rivera, Frida Kahlo and David Alfaro Siqueiros, looked into the lens of Matiz’s Rolleiflex. Matiz also photographed Janice Logan, Luis Buñuel, Marc Chagall, Louis Armstrong, Álvaro Mutis, Pablo Neruda and Walt Disney. His portraits show sensitivity, intimacy, the product of what one admirer called a “profound psychological penetration”. He collaborated with Siqueiros to document his murals, though the two men later had a very public disagreement. When Siqueiros mounted an exhibition of paintings derived from his photographs in 1947, Matiz claimed some of the works were plagiarized. Siqueiros retaliated by calling Matiz an enemy of muralism and a North American imperialist. Things really escalated out of control when Siqueiros arranged for Matiz’s studio to be set on fire, forcing the photographer, concerned for his safety, to flee with his family to Venezuela. It would be almost fifty years before he returned to Mexico. Matiz lived the remainder of his life in various countries, dividing most of his time between Colombia and Venezuela. Besides his art, he also started newspapers and opened art galleries. In 1951, a gallery he owned in Bogota staged the first exhibition of the Colombian painter Fernando Botero. Matiz regularly claimed to miss Mexico, but did not return there until 1995, and was then profoundly shocked when he learned that the building that had housed his studio had been totally destroyed in the 1985 Mexico City earthquake. 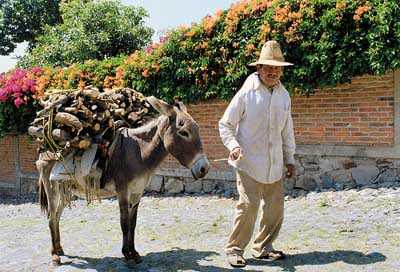 He remained active, despite failing eyesight, traveling through Mexico in 1997 taking pictures of rural workers for “Los hijos del campo”, the last book he illustrated. Matiz’s photographic work is considered to be some of the finest of the twentieth century, demonstrating remarkable versatility, composition and technical ability. In 1948, he was named one of the world’s 10 best photographers. Examples of his work can be found in many major museums, including the Museum Of Modern Art (MoMA) in New York and the Tate Gallery in London, U.K.
Leo Matiz died in Bogota, Colombia, on 24 October 1998. 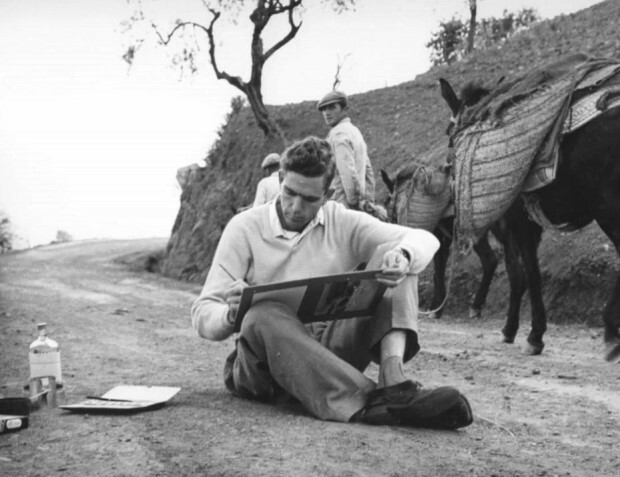 His images and artistic legacy are conserved and promoted by the Leo Matiz Foundation. Sincere thanks to Alejandra Matiz, the photographer’s daughter, and President of the Leo Matiz Foundation, for providing details of her father’s photo-account of Lake Chapala. Miguel Angel Flóres Góngora. 2005. “Leo Matiz: The Eyes of Time” in ReVista (Harvard Review of Latin America). Leo Matiz. 1942. “Chapala, mar jaliciense” in Así # 66, 14 February 1942: 31-35. Carlos López Ruíz (1912-1972), another Colombian artist, illustrator and caricaturist, who lived in Mexico in the early 1950s. Photographer and hotelier Winfield Scott was born in Galesburg, Michigan, on 15 July 1863 and died in Los Angeles, California, on 19 January 1942. Scott spent six months in Mexico in 1888, and then lived in the country, with occasional breaks in California, from 1895 to 1924. From 1890 to 1894, he was working in Oakland, California. In 1894, he spent a weekend in jail when an aggrieved ex-colleague, unhappy about the terms of a business deal, denounced Scott for taking and possessing “indecent” photographs. A contemporary news report described them as “obscene photographs of semi-naked young Chinese girls” between 10 and 14 years of age. Scott was freed and exonerated because it proved impossible to find any such photos in his possession. This may well have been the stimulus, if any was needed, that prompted Scott to move to Mexico in 1895 and settle in Silao, Guanajuato, where he undertook photographic commissions for the Mexican Central Railway (Ferrocarril Central Mexicano) and, from January 1897, for the National Railways (Ferrocarriles Nacionales). He is known to have photographed the famous Guanajuato mummies. He also sold some photos in 1896 to the Field Columbian Museum in Chicago. His railway-related images include photos of canyons, stations, rural landscapes, and everyday life of the people living close to the tracks. 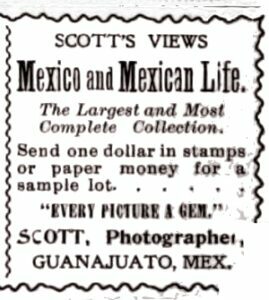 By 1897, an advert in Modern Mexico (January 1897) claimed that he had amassed “the largest and most complete collection of scenes of Mexico and Mexican life”. In that same year, Wilson’s photographic magazine called him a pictorialist photographer and publicized his hundreds of images of Mexico and the U.S., with 5×8 prints on sale by mail order for $3 a dozen. On 21 October 1898, now 35 years of age, Scott married 18-year-old Edna Browning Cody in the city of León, Guanajuato. 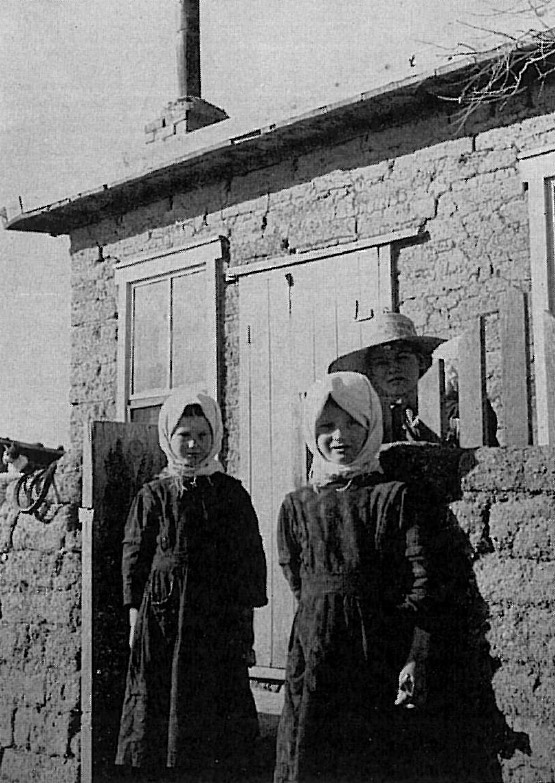 Edna was from Lakeview, Michigan, but lived with her parents in the mining camp of Mineral de Cardones in Guanajuato. 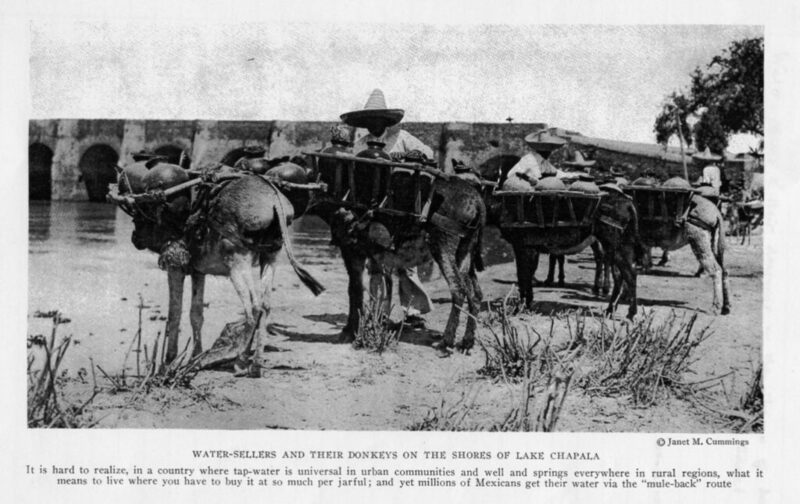 Several of his photos, including a panoramic view of Chapala, were used to illustrate A tour in Mexico, written by Mrs James Edwin Morris (The Abbey Press, 1902). A 1903 list of Scott’s Views of Mexico (published in Ocotlán, Jalisco) has 2486 numbered titles for Scott’s Mexican photographs, together with a testimonial attesting to their quality from Reau Campbell, of the American Tourist Association, author of Campbell’s New Revised Complete Guide and Descriptive Book of Mexico (1899). Scott’s photographs were in wide demand for postcards. 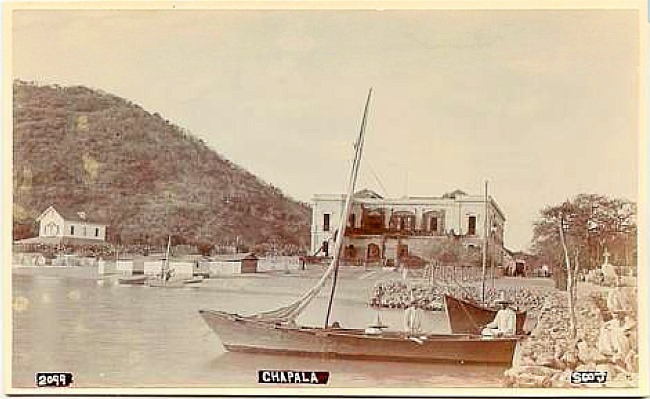 Three small photographs of Chapala, all by Scott, were used on the first postcard published by Juan Kaiser (with the imprint “Al Libro Mayor, S. Luis Potosí.”) in about 1901. Scott’s specialty was the portrayal of women and children, as well as landscapes, and Mexico’s national photographic archive holds no fewer than 223 female portraits taken by Scott. Many of his portraits are exceptional in composition. Scott was one of the first of Mexico’s commercial photographers to pay as much attention to the context and surroundings as to the subject. His success in this regard is partly attributable to his rapid adoption of smaller and lighter cameras. In 1908 Scott’s photographs were used to illustrate an account in Modern Mexico about the Colima-Manzanillo railway, then under construction but due to be completed in time for Mexico’s centenary celebrations in 1910. Winfield Scott’s daughter Margaret/Margarita (aged 15 in 1921) was born in Mexico in about 1906. Witter Bynner and others say that Scott’s wife (Margaret’s mother) was Mexican, but do not offer a name. Was this the same Edna Cody Scott whom Scott had married in 1898? Equally unclear is the precise timeline when Scott was managing a hotel in Ocotlán, the source of stories Scott shared with D. H. Lawrence, his wife Frieda, Witter Bynner and others in 1923. When the Mexican Revolution broke out in 1910, Scott moved to California, but returned in 1912, and then divided his time between California and Mexico until 1924. When applying in 1921 (in the U.S.) for a new passport so that he can return to Ocotlán, he described himself as 5′ 5″ tall, with light blue eyes and brown hair. Scott: The Hotel Arzapalo, early 1900s. By 1923, Scott had been widowed and was manager of the Hotel Arzapalo in Chapala, living there with his daughter Margaret in rooms on the west wing facing the lake. D. H. Lawrence used Scott as the basis for the hotel owner Bell in his novel The Plumed Serpent. Lawrence’s traveling companions Witter Bynner and Willard “Spud” Johnson stayed at the hotel, which was conveniently close to the house that Lawrence and his wife Frieda had rented. 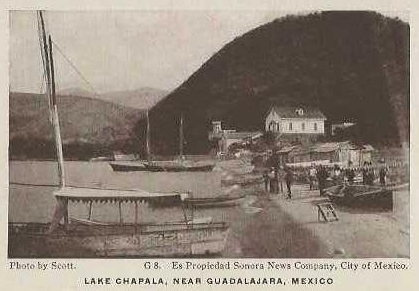 Elsewhere, Idella Purnell, a Guadalajara poet who spent time with Lawrence, has written about how she and Margarita Scott accompanied the Lawrences by boat to the railway station in mid-July 1923, when Lawrence and his wife Frieda left Chapala to return to Guadalajara and then New York. Later that year, when Lawrence and Kai Gøtzsche visited Guadalajara in October 1923, they chose to stay at the Hotel García because Winfield Scott had now moved from Chapala and was managing that hotel. Scott did not remain at the Hotel García for long. By the end of the following year, he had moved back to California, where he lived until his death in 1942. Witter Bynner, Journey with Genius (1951). Chapala (3 postcard shots) DeGolyer Library, Southern Methodist University. Benigno Casas, “Charles B. Waite y Winfield Scott: lo documental y lo estético en su obra fotográfica”, in Dimensión Antropológica, vol. 48, 2010, pp. 221-244. 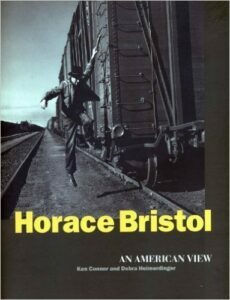 Famous American photographer and photojournalist Horace Bristol lived in Ajijic from 1967 to 1976. Born in Whittier, California, on 16 November 1908, Bristol studied architecture at the Art Center of Los Angeles, before moving to San Francisco in 1933 to work as a commercial photographer. By chance, Ansel Adams lived near Bristol’s studio and the two became friends. Bristol was introduced to other leading photographers and artists including Edward Weston and Imogen Cunningham. In 1936, Bristol became one of Life Magazine‘s founding photographers. He went on to produce half a dozen Life covers. His photos also appeared in the pages of Time, Fortune, Sunset, and National Geographic. In 1938, Bristol worked with John Steinbeck to document the plight of migrant farmers in California’s central valley during the Great Depression. Life turned down the story and Steinbeck opted to write his findings as a novel, The Grapes of Wrath. Bristol’s photographs from this time were later known as “The Grapes of Wrath” collection. When the U.S. entered the second world war in 1941, Bristol was recruited to the U.S. Naval Aviation Photographic Unit. He traveled to Africa and Japan, helping to document the invasions of North Africa, Iwo Jima and Okinawa. After the war, Bristol settled in Tokyo, Japan, sold photographs to magazines in Europe and the U.S. and became the Asia correspondent for Fortune Magazine. Bristol published several books (on Japan, Korea and Bali) and established the East-West Photo Agency. This productive period of his life came to an abrupt end in 1956 with the death by suicide of his first wife, Virginia, following a hysterectomy. Bristol was so distraught, he burned many of his negatives, packed his photos away and retired from commercial photography. The following year, he married Masako, a Japanese librarian 20 years his junior. A decade later, the couple moved with their young daughter, Akiko, to Lake Chapala, where their second child, Henri, was born. During their years in Ajijic (1967-1976) Bristol worked as an architect, designing and building several lakeside houses. In 1976, the family moved to Ojai, California, because Bristol and his wife decided that they did not want to bring up their two children as expatriates. Almost a decade later, Henri, then 15 years old, had a high school assignment to read The Grapes of Wrath. This prompted Bristol to look through his photo archive and he began to regret his decision all those years earlier to put away his camera. He brought his surviving negatives out of storage and resumed his photography career. In later years, his work was the subject of several retrospective exhibitions. Bristol continued to make his home in Ojai, California, until his death on 4 August 1997 at the age of 88. Bristol’s photographs will not be forgotten, since Bill Gates now owns the digital rights to most of Bristol’s 16,000 negatives. Bristol’s work is included in many major collections, including those of the Getty Museum and the Los Angeles County Museum of Art, and is the subject of the 2006 documentary, The Compassionate Eye: Horace Bristol, Photojournalist, written and directed by David Rabinovitch. Artistic success clearly runs in the family. In 2006, son Henri Bristol opened East/West Gallery in Santa Barbara, California. Hugo Brehme was born in Eisenach, Germany, 3 December 1882, and died on 13 June 1954 as a result of an auto accident in Mexico City. 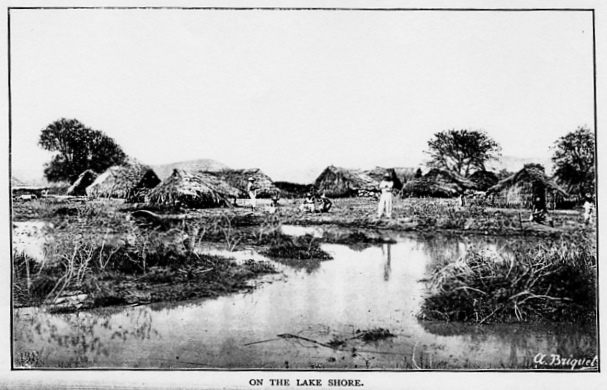 Brehme certainly visited and photographed Lake Chapala on more than one occasion. Images of the lake and its environs appear in his work from around 1920. 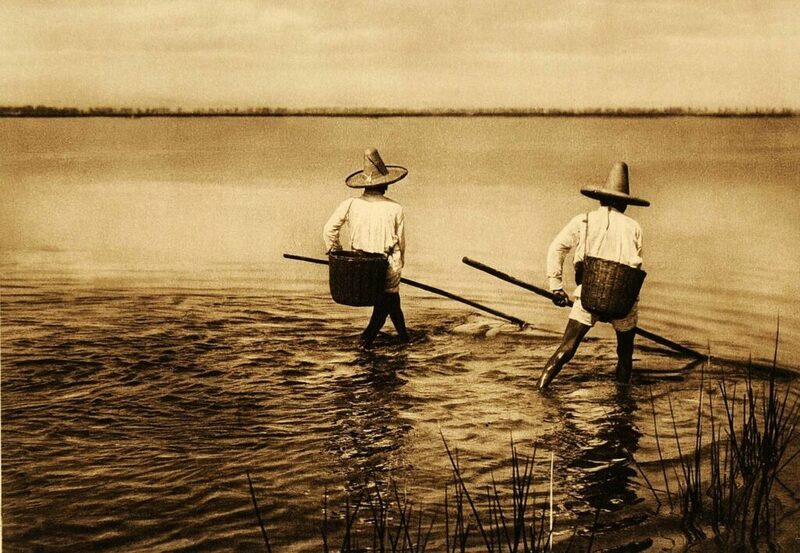 Hugo Brehme: Fishermen in Lake Chapala. ca 1925. Brehme studied photography in Erfurt, completing his studies in 1902, and then opened his own studio. He took several trips to the then-German colonies in Africa. He first visited Mexico in 1906, strongly influenced by having read Mexiko: Eine Reise Durch das Land der Azteken (“Mexico, a journey through the land of the Aztecs“) by Oswald Schroeder (published in Leipzig 1905). On 14 August 1906, Brehme, then 23 years old, left Hamburg for Veracruz, Mexico, on board the SS Fürst Bismarck, traveling 3rd class. The ship called in at Dover (U.K.), Le Havre (France), Santander (Spain), A Coruña (Portugal) and Cuba, en route to Mexico. He clearly liked what he found in Mexico, and saw a future there, since he returned to Germany, married his sweetheart Auguste Hartmann, and soon afterwards, in August 1908, the couple were on their way back there. They traveled on the SS Kronprinzessin Cecilie, but this time in the relative luxury of 2nd class! By 1910, Brehme had a studio in Mexico City and rapidly gained popularity among the wealthier residents. The following year, he joined Casasola’s Agencia Fotográfica Mexicana. He documented many of the key events of the Mexican Revolution (1910-20), including the Decena Trágica of 1913, Emiliano Zapata’s activities in Morelos, and the 1914 U.S. intervention in Veracruz. Brehme quickly established himself as an outstanding commercial photographer, specializing in black-and-white postcard views. For more than 40 years, he roamed the country, using excellent photographic technique and composition to capture all manner of scenes. Some of his images are hauntingly beautiful, reminding us of a bygone age that we can never hope to regain. 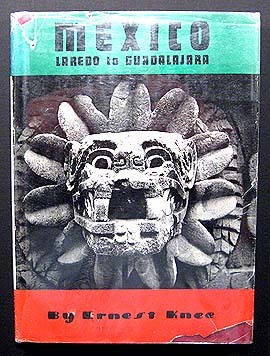 Brehme’s best-known photographic book is México pintoresco (“Picturesque Mexico”) which was published in 1923. A second volume Picturesque Mexico: The Country, The People and The Architecture appeared in 1925 (in English, French and German). These are among the masterpieces in the history of photography in Mexico. Brehme, who is also credited with having introduced the first photographic Christmas cards into Mexico, was granted Mexican citizenship shortly before his death. His son Arno, born in Mexico in 1914, also became a photographer and worked in his father’s studio. Of the relatively small number of photos attributed to Arno (Armando Brehme), perhaps the most interesting are those of the eruption of Paricutin Volcano in 1943. There is no question that some images signed by Brehme were actually taken by other photographers, and there are doubts about others. For example, see this analysis (in Spanish) of some of his photos. Equally, there is no doubt that many Brehme photos were used, without adequate attribution, by other authors. These issues aside, Brehme was clearly a master of publicity, and helped to foment an interest in Mexico, and travel in Mexico, that extended far beyond its borders. Benigno Casas. “Hugo Brehme: el paisaje romántico y su visión sobre lo mexicano”, Dimensión Antropológica, vol. 41, septiembre-diciembre, 2007, pp. 173-201. Arturo Guevara Escobar. Hugo Brehme y la pérdida de la Fe. Ernest Walter Knee was born in Montreal, Canada, on 15 May 1907 and died in Santa Fe, New Mexico on 7 October 1982. He is most often associated with the Santa Fe art community, but also traveled widely on assignment. Knee was a talented photographer who first visited Santa Fe in 1931; he fell in love with the location, and eventually became part of the flourishing art community there. Knee’s friends included a wide circle of famous artists and photographers, including Edward Weston, Gustave Baumann, Ansel Adams, Georgia O’Keeffe and Laura Gilpin. Over 100 of his powerful black and white photographs were the subject-matter for Ernest Knee in New Mexico: Photographs, 1930s-1940s, by his third son Dana Knee, published by the Museum of New Mexico Press in 2005. 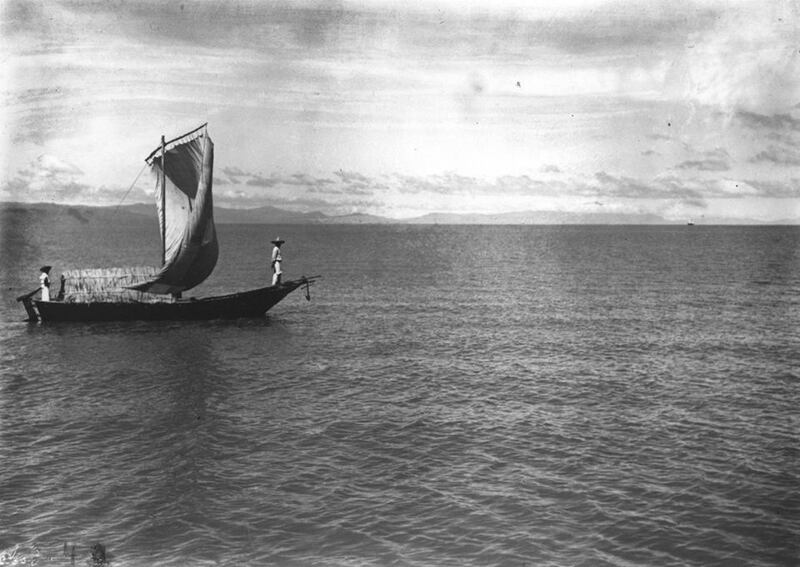 One of these photographs, dated 1941, depicts a lone sail boat on Lake Chapala, though it is unclear how much time he spent in Chapala. A photograph of Chapala is also included in his Mexico: Laredo to Guadalajara (Hastings, New York, 1951). This book showcases more than 100 of his photographs, documenting a pictorial tour from Laredo to Monterrey, Linares, Villagran, Tamazunchale, Jacala, Venta de Carpio, Toluca, Morelia, Patzcuaro, Zamora, Chapala and Guadalajara. Three of his images of Chapala can be seen on artworld. Among Knee’s many other claims to fame is that he was, for a time, Howard Hughes’ personal photographer. He was also the first cameraman to record Angel Falls in Venezuela. His landscape and documentary photographs appeared in Life and National Geographic. 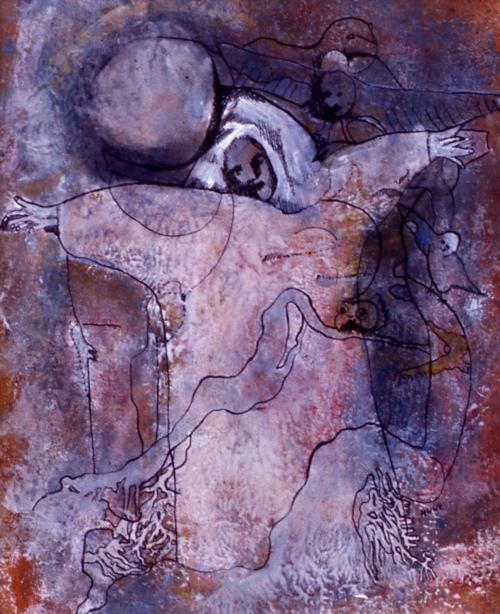 Institutions which have displayed Knee’s work include The Snite Museum of Art, University of Notre Dame; George Eastman House, Rochester New York; Museum of Modern Art, New York; Center For Creative Photography, Tucson; Santa Barbara Museum of Art, Santa Barbara; Los Angeles County Museum of Art, Los Angeles; California Museum of Photography, Riverside; Princeton University of Art, Princeton; The Minneapolis Institute of Art, Minneapolis; Spencer Museum of Art, Lawrence Kansas; New Orleans Museum of Art New Orleans; Milwaukee Art Museum, Milwaukee; University of Oklahoma Museum of Art; University of New Mexico, Albuquerque; New Mexico State University, Las Cruces; Museum of New Mexico, Santa Fe; The Harwood Foundation, Taos. Professional photographer Jack Weatherington, born in Tulsa, Oklahoma, on 12 October 1933, moved to Ajijic in 1988 and resided there, continuing to take magnificent photographs, until his death in Guadalajara on 20 Feb 2008. 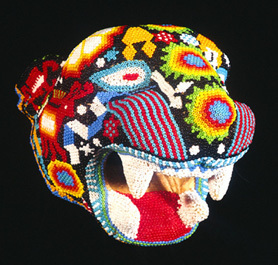 Soon after relocating to Ajijic, he became fascinated with Mexican masks, “especially the hauntingly beautiful, and sometimes simply haunting centuries-old masks native to the indigenous peoples of Mexico.” (Mexconnect.com). On leaving high school in the U.S., Weatherington joined the U.S. Navy, and served as a medical corpsman. After his military service, he worked as a professional photographer most of his career. During his twenty years in Ajijic, he was an active member of the Ajijic Society of the Arts, and his photographs, especially those of floral and woodland scenes, regularly won awards in local shows. He also took exquisite portraits of some of the Lake Chapala region’s most famous residents, including the travel writer-entrepreneur Neil James. (James bequeathed her property, including its extensive gardens, to the Lake Chapala Society). Weatherington also held a solo show of his photographs at the Mio Cardio Gallery in the Chapalita district of Guadalajara. One of the more interesting characters that made Ajijic a lively place to be in the early 1950s was the black American artist Ernest Alexander, known to most people simply as “Alex”. Alex was a painter and photographer who, from about 1950 to 1952, ran the Club Alacrán (Scorpion Club), a restaurant-bar in Ajijic, the hang-out of choice for the resident artists and writers of the time. Relatively little is known for certain about Alex, though he is the subject of a fascinating memoir written by Sean Wilder. Wilder first met Alex in 1958, when the latter was living on handouts in the North Beach area of San Francisco. Wilder, later a practicing psychoanalyst, was only a teenager at the time but spent much of the following two years trying to comprehend Alex, while simultaneously questioning his own motives and desires. Wilder’s book, Alex, provides some telling insights into Alex’s charismatic, almost guru-like personality. In an epilogue to the book, Wilder sketches out what little biographical information he has gleaned about Alex, either from Alex himself, or from a select handful of people who knew Alex both in Ajijic and in San Francisco. Alex intimated to Wilder that he had spent his childhood in Long Branch, New Jersey, and that there was, or had been, money in the family. Wilder describes how Alex spoke “educated Eastern Seaboard English”, with an impressive vocabulary, and used language colorfully, as a form of “oral poetry”. Alex was a verbal gymnast, giving quick retorts and enigmatic responses. Following a period of military service in a communications unit in the Pacific, Alex returned to civilian life after the second world war, with a metal plate in his head, and used his G.I. Bill funding to take art classes at the South Side Community Art Center in Chicago. Alex’s magnetic appeal helped foment the nascent jazz and poetry scene of the Art Circle (a housing community for artists) on the near north side of Chicago. Among the poets that Alex became close to were Bob Kaufman, Gwendolyn Brooks and ruth weiss, who would herself visit Ajijic in the late 1950s. Gwendolyn Brooks, a close friend of Alex, became the first black writer to win a Pulitzer when she was awarded the Pulitzer Prize for Poetry in 1950 for her second collection, Annie Allen, published the year before. 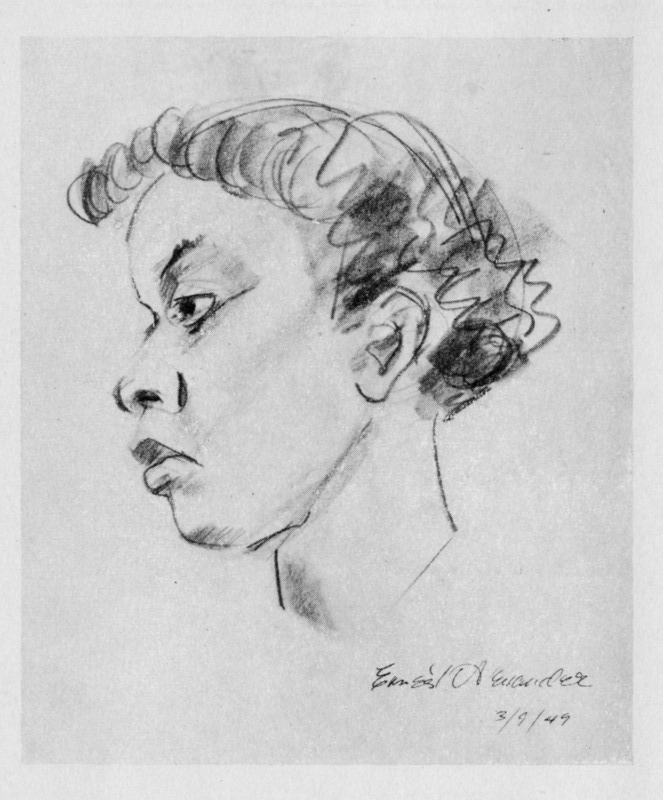 The frontispiece of Annie Allen is Alex’s simple, yet powerful, portrait of Brook’s head, an illustration also used on the book’s dust jacket. According to George E. Kent, the author of A Life of Gwendolyn Brooks, Brooks’s poem “A Lonely Love”, published in 1960, is entirely about her intense personal relationship with Ernest Alexander. In 1949, the same year that his illustration was used for Annie Allen, Alex had a painting chosen for inclusion in the “53rd annual showing by artists of Chicago and vicinity”, a major exhibit at the Art Institute of Chicago. This was a significant achievement for a painter who was apparently largely self-taught. 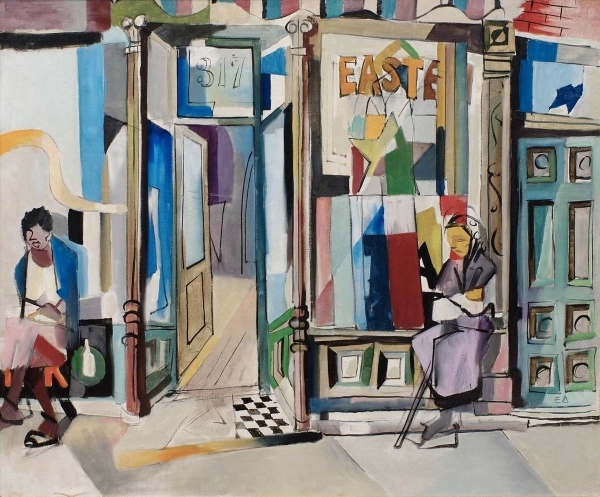 The painting in question, entitled “Shop Front and Doors”, was priced at $350. Among the other artists included in the exhibition were George Buehr (a professor of art for many years at the Art Institute of Chicago) and his wife Margo Hoff. Buehr, and possibly Margo, had spent some time in Ajijic a few years previously, and may well have provided the inspiration for Alex’s decision to transfer his G.I. Bill funding to the Fine Arts school of the University of Guadalajara later that year. In Mexico, Alex studied painting, sculpture and photography, and also met Dorothy Whelan, a Canadian whose husband was serving seven years in a Mexican jail for passing bad checks. Alex and “Dolly”, as she was known, set up house in Ajijic, where Dolly, at least for a time, was a cook at the Posada Ajijic. Among their close friends were painter-potter David Morris and his wife Helen, a former dancer. San Francisco Bay area sculptors Robert McChesney and his wife Mary Fuller were also both in Ajijic at this time. 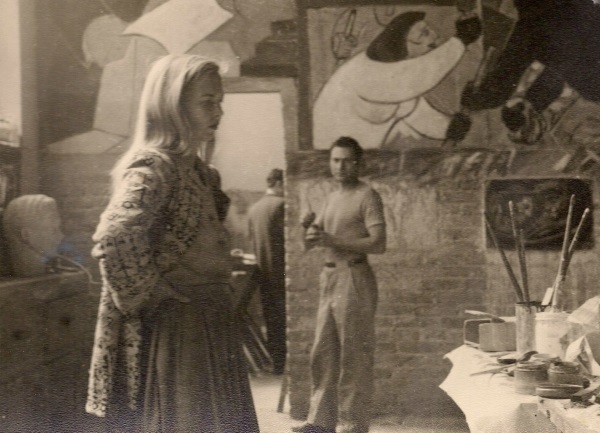 Dorothy Whelan in Alex’s studio in Club Alacrán, Ajijic, ca 1952. Photo reproduced by kind permission of Katie Goodridge Ingram. In Ajijic, Alex opened a restaurant-bar named Club Alacrán (Scorpion Club), which was in operation from about 1950 to 1952. 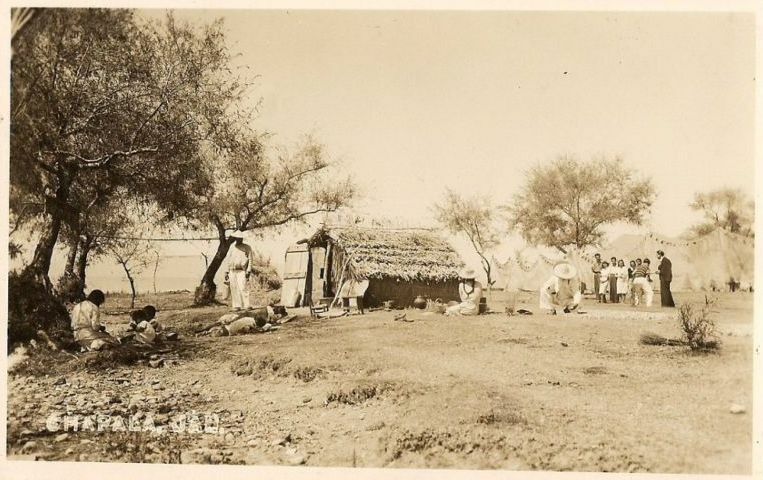 The club attracted locals and expatriates alike. Alex instituted a two-tier pricing system, charging Mexicans less than Americans for their drinks. Katie Goodridge Ingram remembers the building well, because it had previously been the studio of her step-father, the artist and sculptor Mort Carl. The Club Alacrán, on Calle Constitución at its intersection with Ramón Corona, “was set up in a small two-room house with a patio and kitchen area. Alex was a very jolly, welcoming and bright host. It briefly became “the” place.” Ingram also recalls that Alex was a fine cook with a penchant for hosting massive barbecues on the beach. While he was running Club Alacrán, Alex was visited by the ethnomusicologist Sam Eskin. 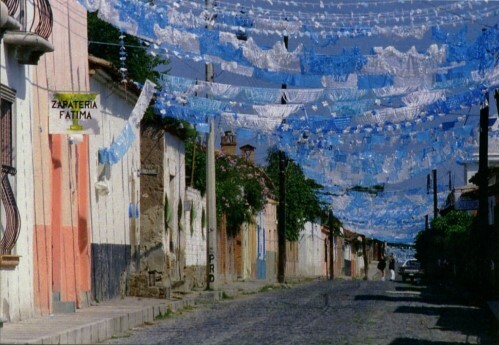 The second part of Eskin’s sound recording entitled Mexican firecrackers: a prayer and a festival (Smithsonian Folkways, 2001) was recorded from the patio of the Scorpion Club and features a religious festival in Ajijic, complete with church bells and pre-dawn firecrackers. 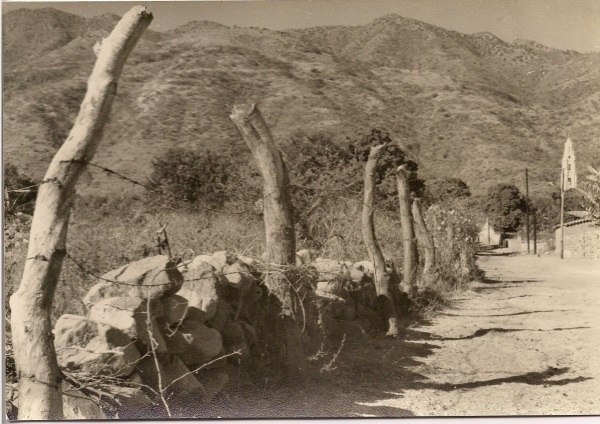 Ernest Alexander: Photo of typical lane in Ajijic, ca 1949. Photo reproduced by kind permission of Katie Goodridge Ingram. 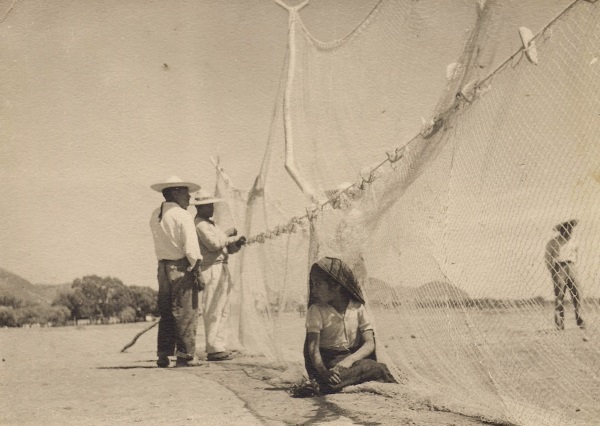 Ernest Alexander: Photo of Lake Chapala fishermen and nets, ca 1950. Photo reproduced by kind permission of Katie Goodridge Ingram. 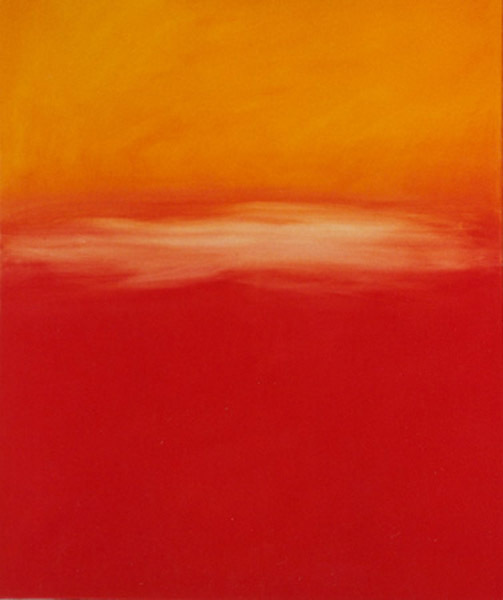 In 1953, Ernest Alexander was one of 14 artists (with Robert McChesney, Lenore Cetone and others) exhibiting in Sausalito, California, at the annual Spring Art Show at the Sausalito Art Center from 29 March to 12 April 1953. A Sausalito News piece in June 1953 refers to Alex and his wife as “the Ernie Alexanders of Marin City”, when listing the artists who attended an art show at the Tin Angel on the Embarcadero in San Francisco. In August 1953, the same newspaper list Ernest Alexander, of “208 Second Street”, as the chairman of the exhibition committee for the second annual Sausalito Arts Center Fair to be held at Shell Beach in mid-September, alongside the annual Regatta. “Charles Carmona, an employee of St. Vincent’s School for Boys north of San Rafael, was given first aid by the Sausalito fire department to check the bleeding from severe facial cuts. He told police that Ernest Alexander, former Sausalitan now living in San Francisco, hit him in the face with a beer bottle after he had danced with Alexander’s wife. Carmona claimed the blow splintered the bottle and police said the injured man had deep cuts on his forehead, nose, chin and both cheeks. Alexander denied he hit Carmona with the bottle and witnesses to the fracas said they did not see Alexander wield the weapon.” No charges were laid because “Carmona refused to sign a complaint against Alexander”. At some point in 1955, Dolly died in hospital while undergoing a second mastectomy. Alex, distraught, began to fall apart. As Alex slid towards insanity (perhaps due to general paresis caused by late-stage syphilis), Mark was was taken into the local foster care system. For the remaining 15 years or so of his life, Alex was never the same. He stopped painting, spent time in state mental institutions, developed paranoia, and lived for extended periods on hand-outs. It is at this stage of his life that Sean Wilder first met him. Wilder recalls that while Alex no longer painted, he enjoyed listening to the music of Billie Holiday and loved cookbooks, reading and valuing them like other people read poetry or novels. The final chapter in the tragic story of Alex’s final years ended in February 1974. The precise date is unknown because he died alone in his apartment at 138-6th St, San Francisco, and his body was not found until four months later. He was buried in Willamette National Cemetery, Portland, Oregon, on 25 July 1974. While Alex’s contributions to the Ajijic art scene have been largely forgotten or ignored, his place in the Chicago art scene has been recognized by the inclusion of his paintings in two major group exhibitions: “Black on Black: The Works of Black artists from Chicago Black Collectors” (University of Illinois at Chicago, 1983) and “The Flowering: African-American Artists and Friends in 1940s Chicago: A Look at the South Side Community Art Center”, (Illinois State Museum, 1993). An earlier version of this post incorrectly named Ernest Alexander’s son as “Luke”. This has now been corrected to “Mark”. My sincere thanks to Katie Goodridge Ingram for sharing her memories of Alex (and photo of his studio) and for permission to reproduce examples of his fine photographs. Sausalito News. 19 March 1953, p 7; 2 April 1953, p 7; 25 June 1953, p3; 27 August 1953, p 5; 25 February 1955, p 1. Wilder, Sean. 2011. Alex (self-published via Lulu.com). Frederick (sometimes Federico/Fritz/Fredrick/Friedrich) Wilhelm Butterlin was born in Cologne, Germany, in about January 1905, and was the middle of three brothers (Otto was older, Ernesto younger). Frederick was a well-known photographer and seems to have been the owner of what was almost certainly one of the first art galleries in Ajijic. In November 1935, “Fritz Butterlin” gave a keynote address on pictorial art in photography, based on observations made on “his long trips”, at the Club Literario de Inglés in Guadalajara. Frederick seems to have continued his photographic career for several decades. His published photos include some evocative portrait photographs of Mennonites in Mexico published in the Mennonite Life editions of October 1949 and January 1952. In 1956, Butterlin, working for “Exclusivas Jimenez SA de CV” placed a series of advertisements in El Informador recommending the use of “ADOX” film for photography. While researching the history of the artists associated with the Lake Chapala region, I came across more and more references to the “two Butterlin brothers”. The problem was that different sources, including otherwise reputable art history sites, gave them quite different first names: Ernesto and Hans? Hans and Frederick? Linares and Otto? There was very little evidence and it seemed impossible to tell which source was accurate, and why different accounts gave such different names, ages and details. They were usually described as “German”, but it was unclear whether they had been born in Germany or were the sons of German immigrants to Mexico. Eventually, I compiled enough evidence to prove conclusively that there were not two Butterlin brothers, but three! Two had been born in Germany and were brought by their parents to Mexico. Safely ensconced in Guadalajara, the parents then had a third son, several years younger than his siblings. The picture was complicated by the fact that two of the brothers used different names at different stages of their life, with the older brother rarely using his first name on his art once he arrived in Mexico, while the youngest brother adopted a surname for much of his artistic career that had no obvious connection to his family name. Small wonder, then, that confusion reigned about the Butterlin brothers on many art history sites, some of which even failed to identify correctly the country of birth of each of the three brothers. There are still great gaps in my knowledge of this family, but the picture that finally began to emerge showed that the Butterlins deserved wider recognition as an artistic family of some consequence. In future posts, I will show how all three Butterlin brothers contributed significantly to the development of the artist colony in the Lake Chapala area, albeit it in rather different ways.